There are all types of bows in many different styles made of everything from wood to super polymers. But none of those are anything new, the technology has been around for as much as 70,000 years. 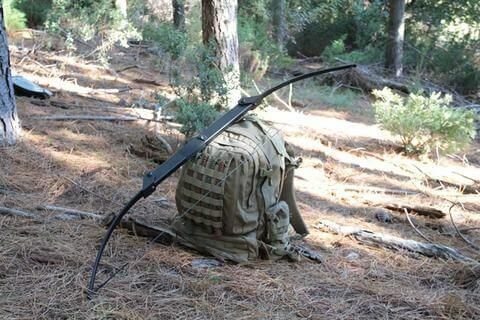 But the SAS Tactical Survival Bow is just a bit of a different creature entirely. Unlike standard bows, this bow made by Survival Archery Systems folds down instead of coming apart when taking it down. It measures only 21” long when stored so you can fit it just about anywhere. Who should be Interested in the SAS Tactical Survival Bow? Designed from the ground up as a survival bow. Folds into a small package perfect for a backpack. No ability to add accessories. Only comes in heavy draw weights. This is not a bow for the range or competitions, this is a bow for when you are in serious need of the tool and it happens to be what you have at hand. 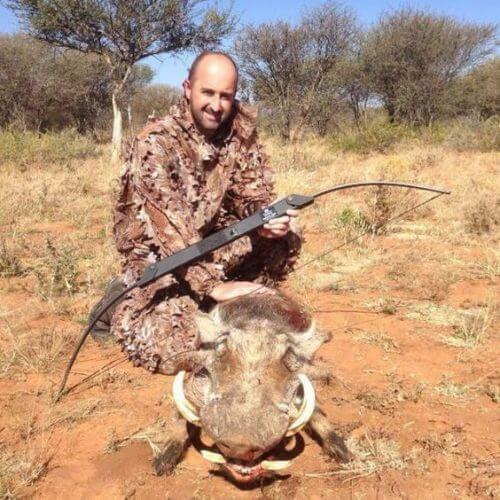 The SAS survival bow , is not really a weekend recreational tool. If you are regularly in the backwoods and you want something that can see you through should the need arise, this could very well be the bow for you! Anyone looking for a pure survival bow will not be disappointed. It’s even small enough to put in a bug out bag. For serious hunting needs, the SAS bow only comes in draw weights of 45 pounds to 55 pounds at a draw length up to 30”. This is not a bow for custom fitting, it is a tool and nothing but a tool. If your draw length is less than 30” you should still get reasonable performance out of this bow. All assembly functions are tool-free, simple, and quick taking less than a minute to go from packed to ready to shoot. The internal portion of the handle is hollow and can fit takedown arrows of an appropriate length to use with this bow. There are no attachment points for sights, quiver or anything else on the SAS bow, just a grip and arrow rest. 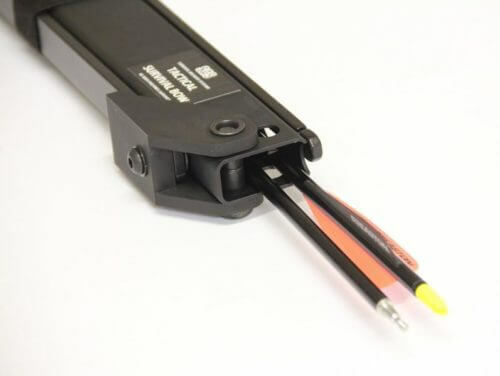 At $200.00 or a little more, the SAS Tactical Survival Bow isn’t exactly cheap but it is far from expensive. Considering the tool you are getting, this price is not beyond what should be expected. You don’t get a lot for the $200.00 but you do get exactly what you pay for. I admit that I had little expectation for this bow from the get go but I was pleasantly surprised. The bow is quite accurate if a little hard to get used to and the arrow speed is FAR better than I would have expected. There is plenty of power and penetration. This bow is a contained unit. Store your string and a few takedown arrows inside the bow and pack it away. When you need it, the assembly is a snap and you are ready to go with everything you need to be able to hunt in one place with no hassle. The SAS bow draws much better than I would expect. There is no “stacking” where the bow suddenly feels harder to draw and no point where the draw is not smooth and even. The release is fast and the bow doesn’t at all feel sluggish. If you designed a bow after a Gen 1 Glock, it would look and feel like this bow. It’s ugly and no two ways about it. The handle portion is square and can become uncomfortable to hold, especially with repetitive shooting. Though I listed it under a pro, the price is also a con if you’re looking for a daily shooter. It just doesn’t seem right to pay $200.00 for this bow when there are plenty of good options for bows that cost far less and function much better. Then again, you’re not looking for a traditional bow when you buy this. If you spend a lot of time in the woods and want something to provide you a hunting option that can be carried easily and function adequate, this is the bow to look at. The SAS Tactical Survival Bow is not a good bow, but it is an acceptable bow. It may also be the only bow you have on you when you need it. It is a kit all by itself. In that respect, this bow does well. I wish they offered this bow in lower draw weights around 30 lbs. I think that would be the sweet spot for this design and a lot more comfortable to shoot. The draw weights they do sell are appropriate for hunting but are just a bit high for my taste. But if you are looking for a product like the Survival Archery Systems Tactical takedown bow, there is no reason why you shouldn’t buy this bow. If you want to get into archery as a hobby or for more than just occasional use, pass this bow up and go with the Samick Sage. 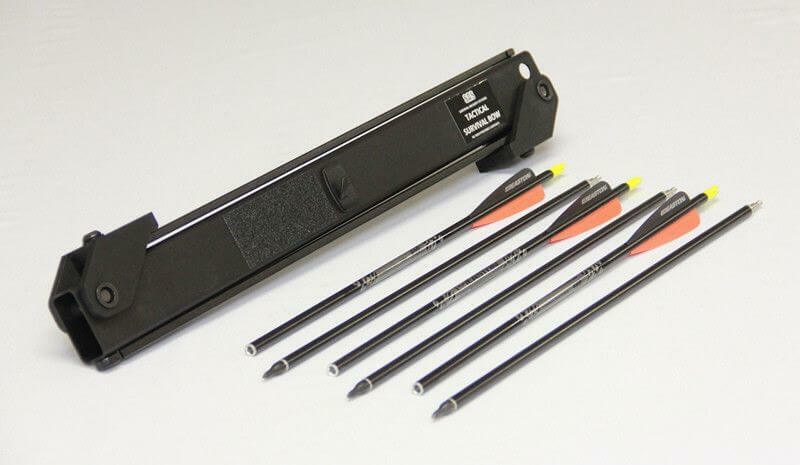 Did you find this SAS Tactical Survival Bow review helpful? Let us know in the comments below. Just read your review of our bow. Nice review and thank you for the time taken. Just one question regarding the noice and hand shock you mentioned. I assume you tuned the bow properly and set the brace height to around 8”? With that brace height you should have all bit eliminated and handshock. And if there was any noise from the “hinge section” that may have been when the pivot pins screw vibrates slightly loose after a fair number of shots. They need to be kept hand tight at all times. Hope this makes sense and if you do get a chance to shoot it again soon and tuned better I would appreciate an adjustment to this article. I also just want to mention that we don’t offer lower poundage versions because lower than 40lbs and bows are not really sufficient for deer and similar sized animals and the market would not really buy such lower poundages according to our research. We do however have a 40# version coming out soon. Thanks for reaching out! I’ll get in touch with the author and have him revisit the review with your suggestions and see if he feels any different about the bow. We’ll post any updates to the review once he gets a chance to revisit it. The author finally had time to get back to this review and take your suggestions into consideration. You were right! He was able to basically eliminate the handshock after tuning it with your suggestions. He also said he didn’t get any strange noises this time, so it could have been loose pivot pins. We’ve adjusted the review accordingly! Great! Thank you for taking the time to do this and I am glad it now functions as intended. Keep up the good work! If you are interested in any more content take a look at our new Recon and Atmos bows.